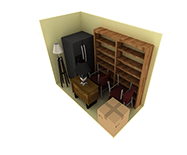 Big Oaks Mini Storage in Sacramento has a wide variety of sizes to fit your need and budget. Check out our availability and rent the perfect unit for you right from our website! Congratulations on your new Big Oaks Mini Storage unit!